When a devoted muskie fisherman needed a place for his trophies, photos and gear, his loving wife suggested he create a log cabin in their basement. Using pine half logs, copper rust slate, comfortable furnishings and generous lighting, interior designer Melissa Bovee transformed a dingy, unfinished underground lair into an inviting retreat. Take a tour and you’ll see why it has become a favorite getaway for the family and their friends. Who lives here: A couple with two teen boys. An out-of-town daughter uses the lower level as a private apartment when she visits. Pine logs were cut in half and affixed to the walls, giving the room its rustic cabin look. Copper Rust stacked stone and a slate floor provide a rich, rugged contrast. “While the rest of their house is more traditional, our inspiration down here was an ‘up North’ cabin,” Bovee says. “He is a big-time fisherman and wanted it to feel rustic and outdoorsy.”The pale wood walls contrast with the dark slate fireplace at the end of the room, drawing the eye to the latter. There are two separate seating areas defined by the furniture: one alongside the fireplace and one for watching TV and playing video games. The leather armchairs are arranged around a playful coffee table featuring a recumbent black bear topped with a sheet of glass. 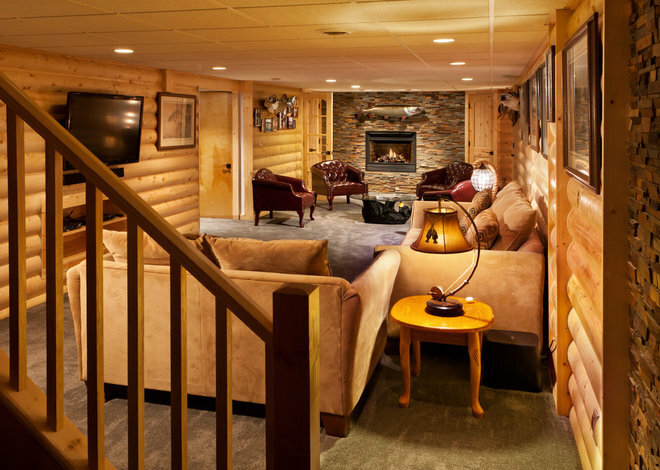 It’s a great example of the basement’s relaxed design. Cleverly tucked beneath the stairs, this wet bar ensures that one rarely has to leave the basement. The custom built-ins include a wine rack, beverage refrigerator and sink. Puck lights underneath the staircase draw the eye to the stacked-stone wall above the countertop. 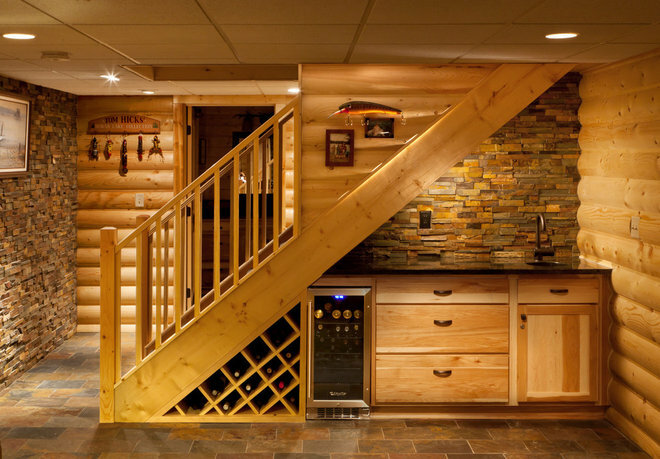 The strong diagonal line of the staircase divides stone and logs, railings and wine rack. The hickory cabinets have a simple, rustic style, with unfussy doors and drawers. The countertop is granite. The plan reveals how the spaces relate to one another. 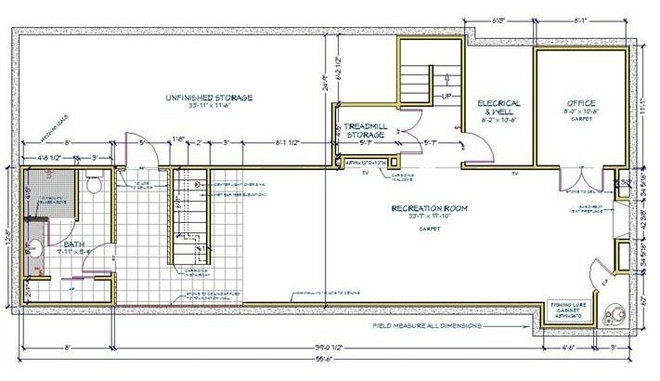 Closets include storage for fishing gear, a sump pump and a place in which to tuck away a treadmill. 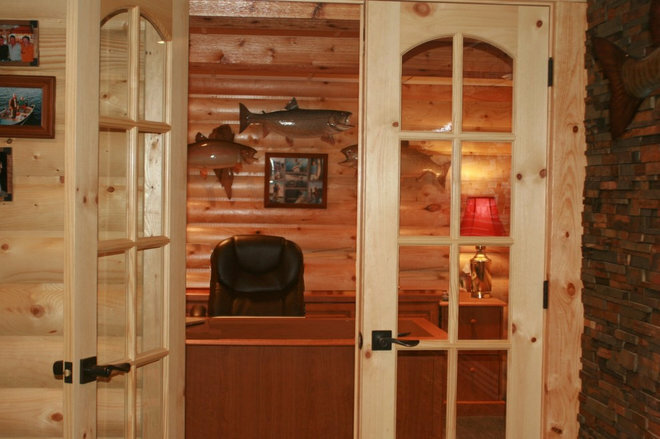 A special closet (visible in the lower-right corner of the plan) is equipped with French doors and custom lighting, providing extensive storage for the husband’s collection of handmade muskie fishing lures. Custom French doors also lead to an office. The owner is a catch-and-release fisherman; the trophies are replicas made to remind him of his triumphs. The bathroom is a great place to warm up and clean up after a long day of fishing, and also serves guests who are staying on the lower level. 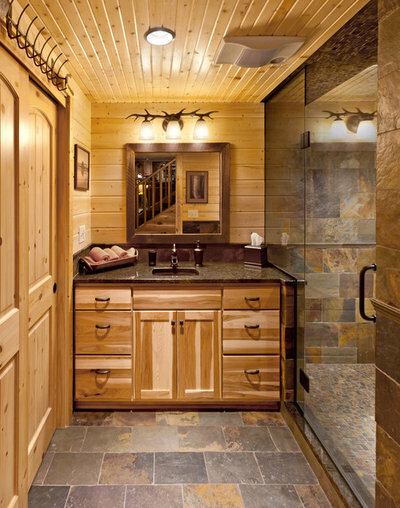 Knotty pine overhead and on the walls, and coppery slate tile underfoot and in the shower, create a rustic jewel box of a bathroom. The frameless glass shower stall allows a clear view of all of the slate tile in the shower, which features both a rain showerhead and a handheld showerhead. 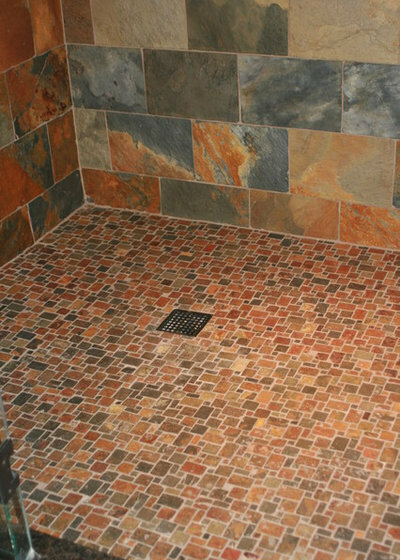 The color variations in the tile add scrumptious earth tones and energy. Now that the basement is done, it has become a favorite family space, especially for the teenagers playing video games and hosting sleepovers. Dad may have his man cave, but he’s rarely alone.